Hi, my name is Zbyněk Buřival. 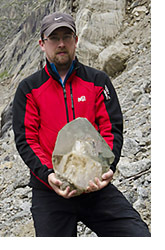 I am a professional geologist and photographer based in the Czech Republic. I took up photography pretty early in life, and being an avid mineral collector I naturally began photographing minerals in 2002. Just one year after my first foray into mineral photography, I launched my own website, MineralExpert.org, which is an open gallery of mineral photos with over 8,000 mineral photos by various photographers. My mineral pictures have been published on many websites, in some magazines, and several have been featured in books. You can see some of my photos, including some of my freelance photography, on my personal photo-blog burivalphotography.com. If you have any questions, comments or new ideas, do not hesitate to contact me at zbynek(at)burival.com. Looking forward to get your feedback!